You can see previous years’ attempts here. 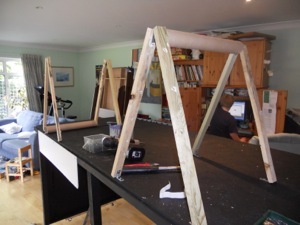 This blog charts the progress of our family’s work to create a float for our village carnival. UNLIKE NORMAL BLOGS, I’LL ADD STUFF AT THE BOTTOM OF THE PAGE, SO NEWCOMERS CAN READ IT IN ORDER! We’ve entered a family float since 2002… mainly because we’ve been involved in so many local organisations that it was hard to choose which one to support. 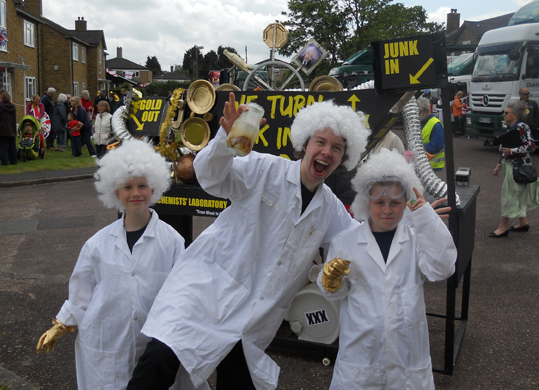 Besides, we have great fun thinking up the project and building the bits as a family! 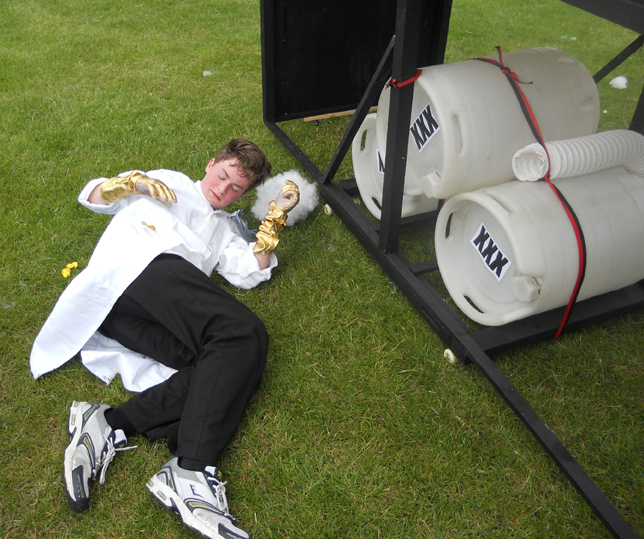 2009: Theme was ‘Musicals’, we did ‘The Sound of Music’. 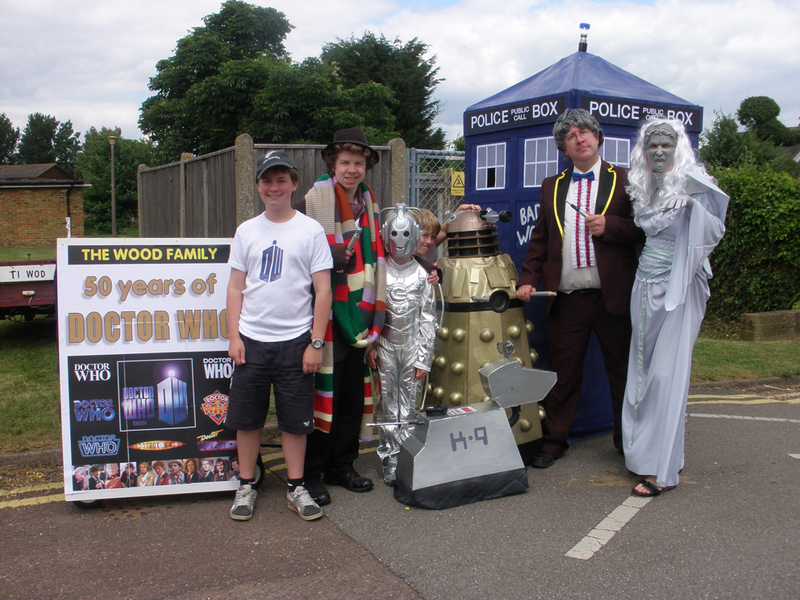 2010: Theme was ‘the past 50 years’ – we chose ’50 years of Doctor Who’. 2011: Theme was ‘Heroes and Villains’ – we did ‘Great Train Robberies’. 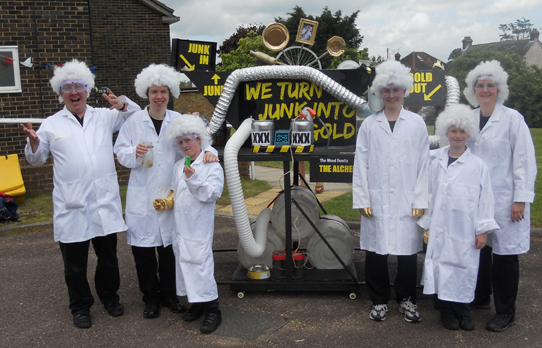 2012: Theme was ‘GOLD’ – so we did ‘The Alchemists’ Laboratory’. We had a bit of a brainstorm around golden things and decided against the obvious James Bond or sporting things (we aren’t a sporting family, and Emma objected to me painting her body gold for a James Bond theme for some reason. 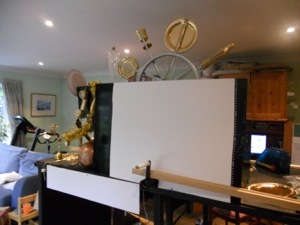 This gives us lots of scope for creating a moving, bubbling mobile laboratory… more news later as we get to work, probably starting over the Easter holidays. 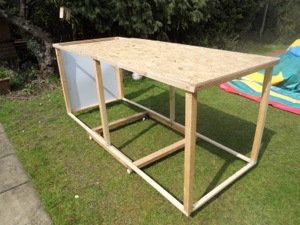 First job was to create the frame of the lab. I used the basic frame for last year’s train (and the previous year’s Tardis), which was in our store room. 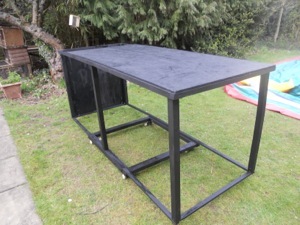 I painted this black, using some great waterproof black paint obtained for free from our fabulous Resource Centre in Staines (Upon-Thames). The sturdy base frame has skateboard wheels and is guaranteed break-proof. To enable the float to not suffer when pushed over speed humps (designed to slow our float down as it goes round the village), I put some small casters at the four outer corners. These don’t touch the ground but make contact when the hump is reached and will make it go over them smoothly. I hope. The chickens were fascinated by all this and quickly got covered in black paint as they investigated it. Into the back room is goes… three large empty plastic barrels (usually used for making rafts with the Scouts) are added for effect. Whether good or bad effect remains to be seen. Next step – the conveyor belt. 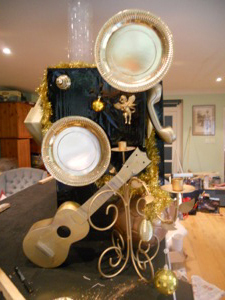 The idea was to have a conveyor belt with gold items attached to it. The belt would turn and items would appear from one end through a curtained box marked ‘junk in’; then disappear into a curtained box marked ‘gold’. 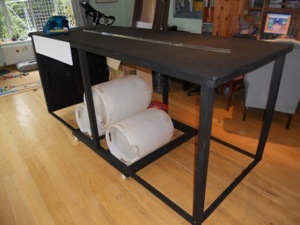 Ever tried building a conveyor belt? 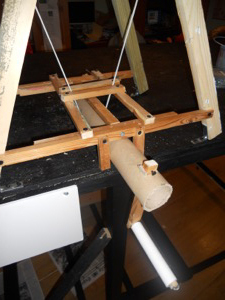 Two A frames, a solid carpet roll on each one, a tight bit of fabric and a plywood board to support the weight will do the trick perfectly. 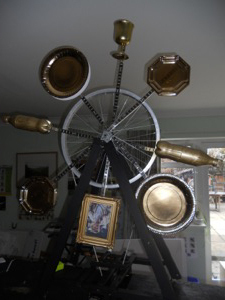 PLAN B was to make a sort of wheel with gold items on it, whirling round to give a similar effect to the above. 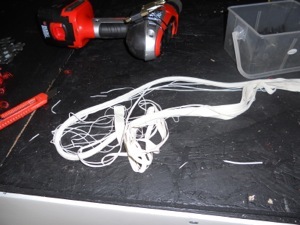 A clever handle thingie was built, and stripped-down parts of a bungee elastic where used as the fan belt. It needed the handle as I couldn’t work out how to put a motor on it that moved it slowly enough. 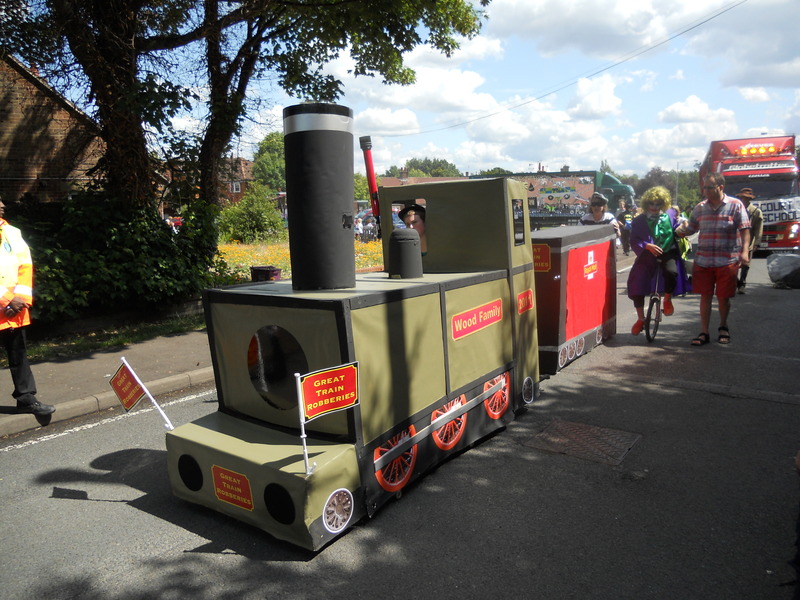 However, Emma seemed absolutely delighted (I assume) with the prospect of her hand cranking this for the hour-long procession around the village. Everything painted black.. lovely. Hope Daniel doesn’t notice his bike wheel is missing. He always wanted a unicycle. 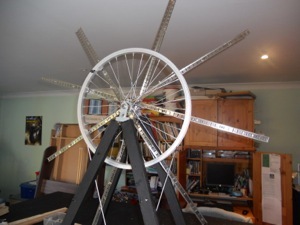 Some sturdy light aluminium strips were threaded into the spokes to hold the gold items, and secured with nylon ties. Cheap gold plates, photo frames etc were hot glued in place… and it works when you turn the handle. Photo in frame is Doc Emmett-Brown from Back to the Future, with Einstein on the reverse. It was a bit noisy, so I coated the moving parts with shiny Fablon (Resource Centre) and WD40. 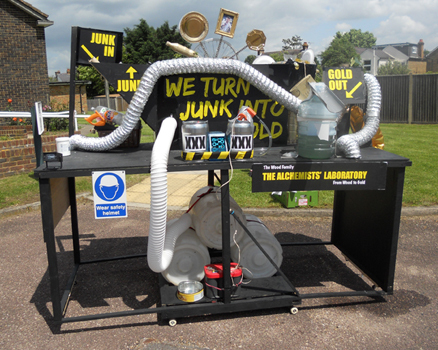 Junk was positioned at one end, gold sprayed junk was placed at the other… lovely effect! Everything was boarded around and painted black. Now this was quite fun.. I got an old office water bottle (Resource Centre, of course!) and an old lilo pump, wired to an old car battery. 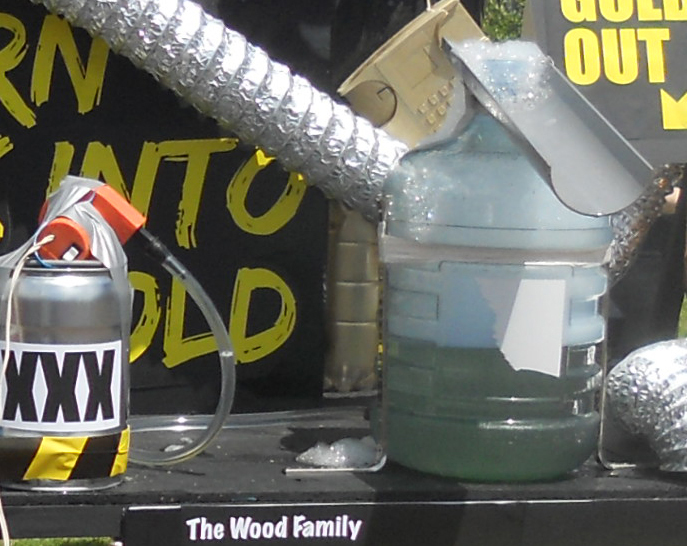 I attached a clear hose to this which forced air into a hole in the base of the bottle. The bottle was half-filled with water and a bottle of Poundland bubble bath (warning: Corrosive). Of course, my first attempt was a disaster, until one of the boys pointed out that the pump should be HIGHER than the hole or the water would simply flood the pump. 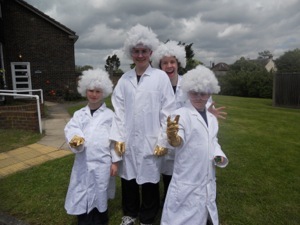 Horaay for science lessons in Year 6 (was was at the dentist on that day) Which it did. 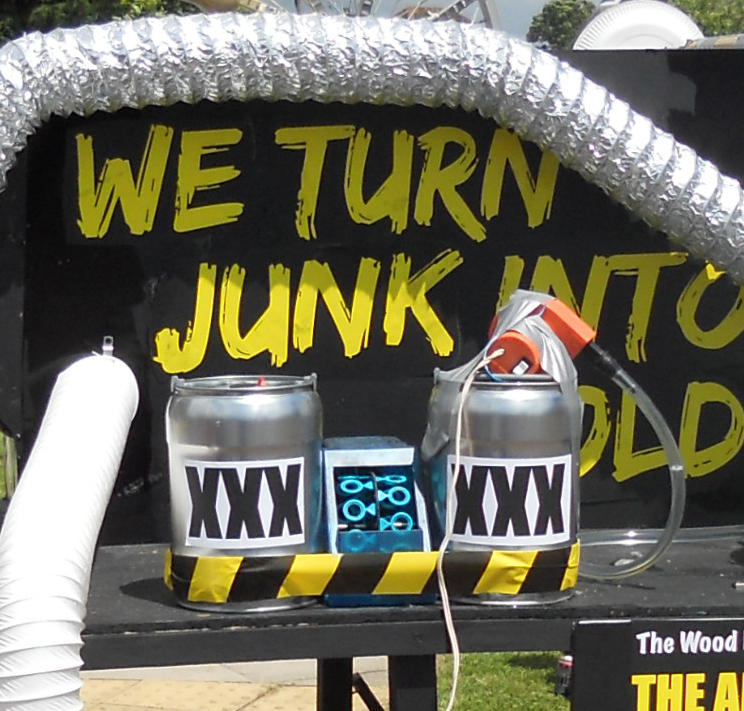 It was then raised and attached to an empty beer keg. The effect was powerful and brilliant – it spewed bubbles and lumps of bubbles like an erupting volcano. I added the guttering in the vain hope that any excess bubbles and water would drain off the side of the float. (Memo to self: get a professional to replace the house guttering when it’s needed). Some industrial strength plumber’s smoke pellets would be lit and put into flasks held by Tim and Me, to be mad professor concoctions – part of the Alchemy process. I also found some amazing finger-to-shoulder gold lurex evening gloves… I got 2 pairs for £5 and we shared them, to make it look like we’d turned our hands into gold while refining the process! I had to take the wheel off to get it out of the house (yay! We have our back room back!). 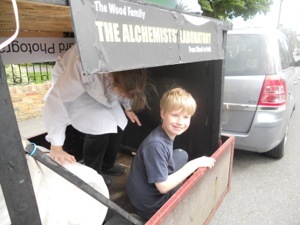 Then it was into the trailer, wedging it securely in place with Emma and Daniel. 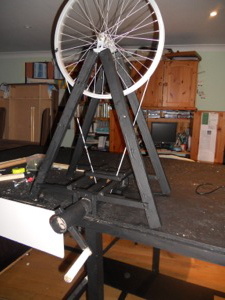 We put it in position at the assembly point, reaffixed the wheel and had our lunch. Everything was tested and we got into costume. 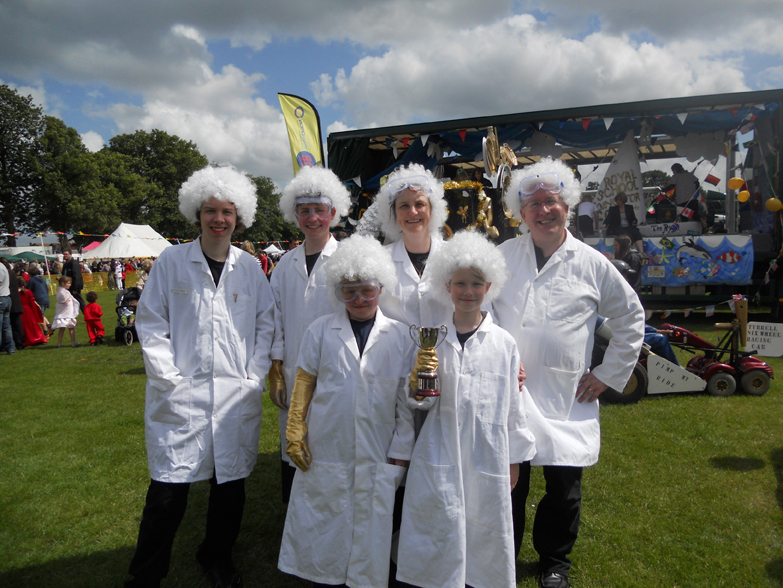 The judges and local newspaper photographers came round and seemed impressed! However… the elastic fan belt snapped and caught just as we started, and Emma wasn’t wearing tights so I couldn’t repair it. Emma seemed strangely delighted at not having to crank it. 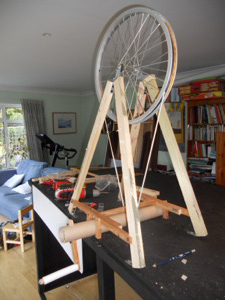 As it happened, it was so windy, the wind blew the wheel round on its own for the whole procession – far better than cranking! The wind blew the smoke and bubbles everywhere but the effect was great. 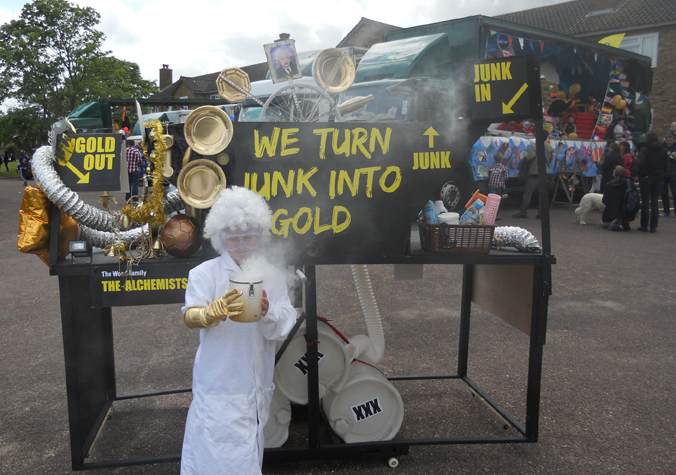 Joshua and Daniel had a pocketful of hundreds of plastic gold coins (£2 for 144 for Ebay) which they gave to children around the route… Tim and I offered loudly to turn all junk into gold, using vaguely passable German mad professor-type accents. Emma helped Ollie steer the megalith which, due to the car battery and 20 gallons (or whatever) of bubble water, made it rather heavy. He was, fair to say, somewhat weary at the end of the 2-mile trek (the grass on the Rec at the end was the killer!) and deserved his beer at the end! This entry was posted on March 16, 2012 at 12:11 pm and is filed under Uncategorized. You can follow any responses to this entry through the RSS 2.0 feed. You can leave a response, or trackback from your own site.